Watch live and recorded video, including broadcast TV, on workplace displays. Card templates make it easy to get started - no training required! Our policies and procedures ensure a maximum level of scrutiny. We quickly respond to increases in customer data and user load. Appspace makes broadcasting enterprise TV fast and easy. Manage playlist channels alongside live & on-demand video. Browse and view channels with remote control functionality just like you would on TVs in your home. Keep your finger on the pulse with live television channels. 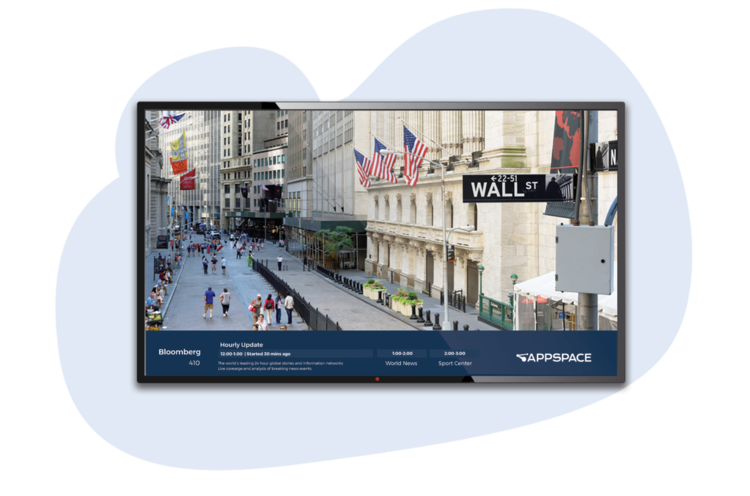 From important news reports to cultural events, Appspace lets you broadcast IPTV streams to workplace displays. Keep everyone in the loop by delivering all-hands meetings and training either live or on-demand through workplace displays.